The FX market is about to blow up in the Fed's face, and there's nothing they can do about it. Foreign exchange (FX) is a zero-sum game: if one currency weakens, another must strengthen. Since the value of a currency is relative to other currencies, all currencies can't weaken together: at least one currency must strengthen as others weaken. Why does any of this matter? Simply put, the stock market is a monkey on a leash held by central banks--just give the leash a little tug, and the monkey jumps. Bonds are a gorilla--harder to control, but still manageable--but foreign exchange is King Kong, trading $5 trillion a day and impossible to control beyond short-term manipulations. Currencies set the underlying trend, not just for bonds and stocks, but for entire economies. A weakening currency makes a nation's exports cheaper in other countries, and the theory is that expanding exports will boost the overall economy--especially if that economy is stagnating or in recession. A weakening currency also makes imports more expensive in the domestic economy, pushing inflation higher--precisely what every central bank in the world desires, on the theory that inflation will make people spend more (since their money is losing value) and reduce the costs of borrowing (which is presumed to stimulate more borrowing and spending). This is why everybody seems to want a weaker currency. But as noted above, every currency can't go down; if some weaken, others have to strengthen. Meanwhile, the strengthening dollar pushed China into its own crisis. China's currency, the renminbi (RMB, a.k.a. yuan), is a special case because its relative value is pegged to the USD by Chinese monetary authorities. 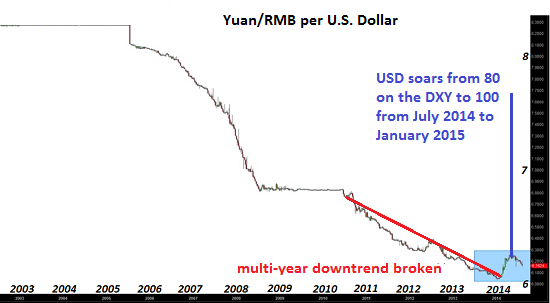 The peg was about 9 to the USD in 2005, and in the following decade China pushed the yuan up to 6 to the dollar. A currency peg means the pegged currency goes up and down with the master currency. As the dollar soared, it dragged the yuan higher, making China's exports more expensive. Given the stagnation of China's debt-bubble dependent economy, the last thing chinese authorities wanted to see was a faltering export sector. As the USD rose, the pressure to devalue the yuan also rose. If you think your money is about to lose 20% of its value due to a devaluation, what can you do to protect your wealth? Get your cash out of the currency that's being devalued and into a currency that's strengthening. Many savvy observers have concluded that the recent G20 meeting in Shanghai led to an informal accord to weaken the dollar to prop up the global economy's shaky foundations--and most acutely, to relieve the pressure on China's yuan, which threatened to destabilize the faltering global economy. 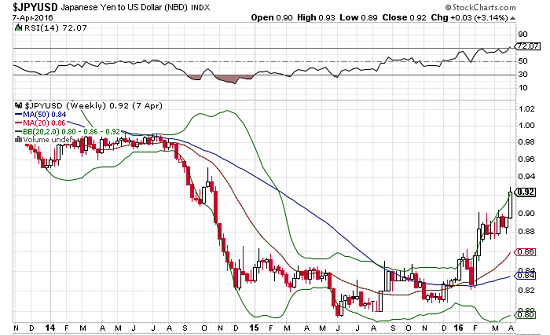 But now the world faces the consequences of a weakening USD: a crisis triggered by a stronger yen. The USD has been yo-yoing in a trading range for a year, as the Federal Reserve has yo-yoed between hawkish declarations of rising rates (which make the USD more attractive and thus stronger) and dovish backtracking (we're never going to raise rates), which then push the USD lower. No wonder the Fed is wobbling: it can't please both Japan and China. 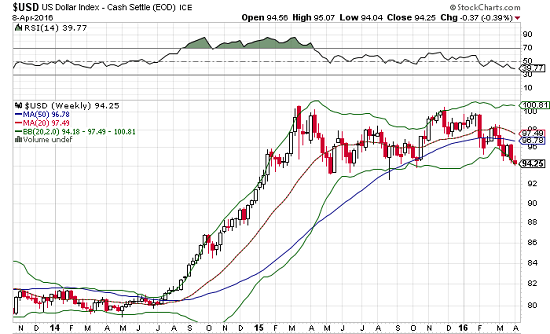 If the dollar plummets, China is delighted but Japan is pushed into crisis. If the USD continues its march higher, Japan is "saved" but China will be forced to devalue the yuan or watch its export sector decline. As I often note, no nation or empire ever devalued its way to dominance or even prosperity. Rather, the devaluation of one's currency is the kiss of death, as everyone quickly learns your money is a ball that can quickly lose air or go flat. Here's my take: Japan has no options left. China, on the other hand, can devalue the yuan as the USD strengthens. Indeed, a very good case can be made that China should devalue the yuan, as a practical adjustment to new global realities. What it can't do is please everybody. This is the inevitable consequence of manipulating markets: you end up being unable to please anyone, because your constant manipulation has created unsustainable carry trades and speculative gambles. The FX market is about to blow up in the Fed's face, and there's nothing they can do about it. What central banks fear most are markets that are not tightly controlled by central banks. The world's central banks are about to sit down to a banquet of consequences arising from seven long years of relentless manipulation. Thank you, George K. ($50), for your splendidly generous contribution to this site -- I am greatly honored by your support and readership. Thank you, Daniel E. ($6), for another superbly generous contribution to this site -- I am greatly honored by your steadfast support and readership.